Princess Polish: Announcing: 30 Days of Zoya + Giveaway! Announcing: 30 Days of Zoya + Giveaway! I wanted to challenge myself to do something different than random swatching for the month of November. So I decided to do a 30-day challenge in which I use one particular brand and have all you readers vote on which colors you want me to swatch. All readers who vote will be entered into a giveaway for two mystery Zoya polishes! And who better to kick off my challenge than Zoya? So starting tomorrow, we'll have 30 days of Zoya polishes, with some extra swatches of collections and random colors, as well as some deal alerts thrown in. Here's how it will work: I'll write about one color, as well as its swatches, and end the post with a choice of three polishes for the following day. And then it's up to you guys! So feel free to comment on this post via Facebook or in the comments section of the blog. 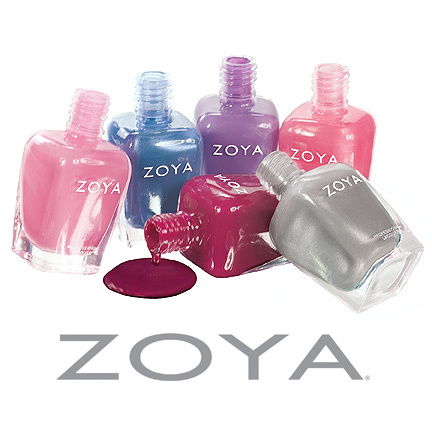 All readers who vote will be entered into a giveaway for two mystery Zoya polishes! 1. You must be a GFC Follower or be a fan of Princess Polish on Facebook to win. 2. You can vote twice per day, once on Facebook and once in the comments section, for a total of 60 entries over the course of the challenge. 3. You can also receive one additional vote OVERALL for sharing the challenge/giveaway on Facebook. 5. Votes from the previous day will no longer be counted for a giveaway entry after the current day goes live. For example, votes for Day 1's color won't be counted after Day 3's post goes live. 6. This is open to individuals in the United States who have reached the age of majority according to their local laws (18 in the US with these exceptions: Alabama and Nebraska, 19; Mississippi, 21). 7. The deadline to enter is 48 hours after the final post of the challenge, Day 30. 8. You must use a valid email address and/or Twitter/Facebook account to enter. 9. Once notified as a winner, you must respond within 48 hours or I will select a new winner. Tomorrow's post will be blue-themed and here are your choices: Crystal, Marina, and Cynthia. Get to voting!!! Don't worry, Jem and Noel will DEFINITELY be options down the road. Waiting on Noel from my Halloween package and Jem is hanging out in my polish bin! Hands down Marina! Good Luck to everyone!